On April Fool’s Day the Trudeau Liberal federal government’s draconian Greenhouse Gas Pollution Pricing Act came into force in Canada–a fitting day on which to inflict a punishing carbon tax law on Canadians. It applies to provinces that do not have their own carbon tax regimes that meet “national standards,” currently Ontario, Saskatchewan, Manitoba, and New Brunswick. The Preamble to this law, based on the fake premise of manmade global warming/manmade climate change, is full of the usual pseudoscientific tropes and untruths about a pretend planetary climate emergency. BECAUSE WE’RE GONNA MODIFY YOUR BEHAVIOUR (micromanage your life) . . .
BECAUSE IF THE PROVINCES REFUSE TO DO IT . . .
. . . WE’LL MAKE THEM . . . The Greenhouse Gas Pollution Pricing Act is a dishonest legislation right from the start, i.e. the title – greenhouse gases are not “pollution.” This from the Liberal government that promised to develop policies and legislation based on science and evidence. It has the fingerprints of the UN’s anti-human, anti-democratic sustainable development program all over it, citing agreements and commitments that Canadians were never consulted about or able to vote on, such as the UN’s 1992 Framework Convention on Climate Change (basis for the UN’s Agenda 21, Millennium Development, 2030 Agenda), the Paris Agreement, and the UN’s unscientifically-derived, made-up global target temperature rise of no more than 2°C (oh wait, no, they reduced it for added hysteria value down to 1.5°C!). Ontario is currently challenging the constitutional validity of the law in the Court of Appeal for Ontario. That’s good news, but unfortunately putting the cart before the horse. We first need a court case about whether or not manmade global warming/manmade climate change is actually a scientifically-proven catastrophic thing. To prove that, we need a baseline of empirical evidence as to what the natural influences on the ever-changing climate are, and then empirical evidence of what, if any, is man’s contribution causing additional change over and above that. Sadly, at the moment there is nothing like this kind of national climate science review on the horizon for Canadians. 15,000 years ago, all of Ontario was covered by glacial ice measuring up to 1.5 km thick. Lake Iroquois formed when these glaciers receded…This glacial lake eventually receded to the level of Lake Ontario. Climate changed naturally throughout the eons. Always has, always will. The biggest lie central to the Fake Climate News narrative, devoid of scientific-method-derived empirical evidence, is that carbon dioxide, CO2, is responsible for manmade climate change, the cause of catastrophic extreme weather events that in reality have occurred only inside rigged climate computer models. None have been borne out by real-world observations and empirical evidence. Fake Climate News is the pretext for the draconian control-and-command “mitigation measures” of the Liberals’ fraudulent-green energy policies, enabled by anti-democratic and anti-human legislation such as the Green Energy Act in Ontario. The religious mission against plant fertilizer in the hope of holding back the tide by half a millimeter in 2100 is noxious, damaging, dangerous in so many ways. It deprives the poor of cheap energy, good jobs, and warm houses. The evil climate fakery has spawned a massive, corrupt, $1.5 trillion worldwide climate change industry. In Ontario, the Liberals’ phoney-green energy policies have caused punishing electricity costs and plunged citizens into gut-wrenching energy poverty. Unmoved, the Ontario Liberals continue to oppress and impoverish Ontarians with their useless, destructive, pernicious industrial wind energy fiasco. To make matters worse, the Liberals have imposed what is effectively a callous, irresponsible carbon tax (on thin air) which itself is subject to a further Harmonized Sales Tax (HST)! Just how useless and wasteful industrial wind turbines are is detailed in a December 2016 report submitted by Strategic Policy Economics (Strapolec) in response to the Ontario Ministry of Energy’s formal review of its Long-Term Energy Plan (LTEP). It provides a shocking analysis. …intermittent solar and wind generation…sources require significant backup/storage and entail other integration costs. …wind generation…results in a surplus electricity. Wind generation production will be intermittent. Wind in Ontario tends to arise at similar and coincidental times across the province. Wind is deemed surplus to the hydro or nuclear generation. Imports are called upon to meet the winter ramp if there is insufficient wind production. …wind may be able to “fill in” with the future imports, but does not integrate well with baseload hydro or nuclear. Wind generation will not match demand in the OPO future projections as 50% of the forecasted production is expected to be surplus. Figure 16 compares wind generation patterns to Ontario demand for the period of 2013 to 2015. Over this three-year period, wind generation has increased in the spring and fall when Ontario doesn’t need the supply, and is at its lowest when Ontario needs it most in summer. Peaking in the fall, wind generation does not contribute to its full supply capacity throughout the higher winter demand period. Wind cannot be matched to demand. With the forecasted winter-heavy demand profile, the contrast between wind generation and demand in winter will become as stark as those in the summer. This mismatch leads to surplus energy.  Reduction of natural gas-fired generation. Total useful wind energy therefore represents 4.3 TWh, or 47%, of the wind generation in Ontario. Over 50% of wind generation in Ontario is not productively used by Ontarians. It could be viewed as being wasted through curtailments and/or via uneconomic exports to neighbouring jurisdictions. …historical surplus wind generation is reflected in the production forecast in the OPO D1 and D3 options. These results indicate that 40% to 55% of the planned wind capacity in the OPO may be surplus. This is a very important consideration given that the LTEP focuses on the lowest possible cost future. If wind generation can only be productively used 50% of the time, then its unit cost doubles to $172/MWh from the $86/MWh assumed in the OPO. This suggests that wind generation is the most expensive generation option for Ontario, not including the Tx related costs and other integration issues described in the OPO. Wind and imports represent the two most expensive options in the OPO, yet these options are given significant weight in the OPO. The LTEP process should address this contradiction. The limitations related to wind generation’s contribution to Ontario’s clean supply mix were discussed earlier in this report. …it can be argued that given the natural flow of…wind patterns, as described in Section 3.0, demand does not match these supply resources, and requires either large reservoirs or backup facilities to function. 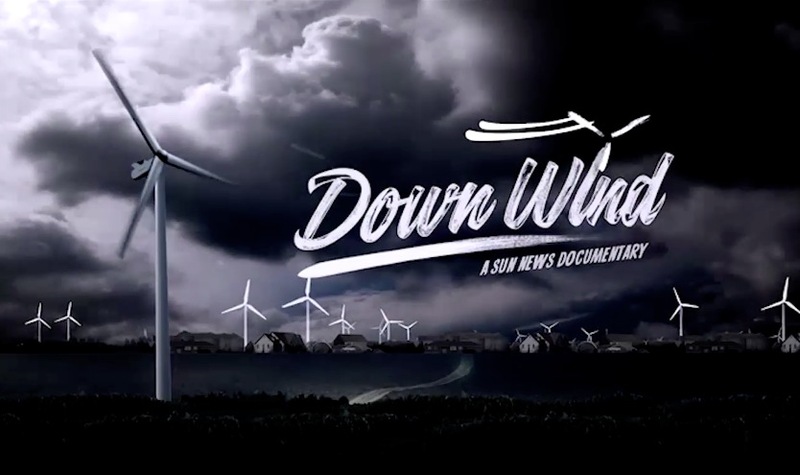 Opposition to wind projects has been evident in Ontario and other jurisdictions. 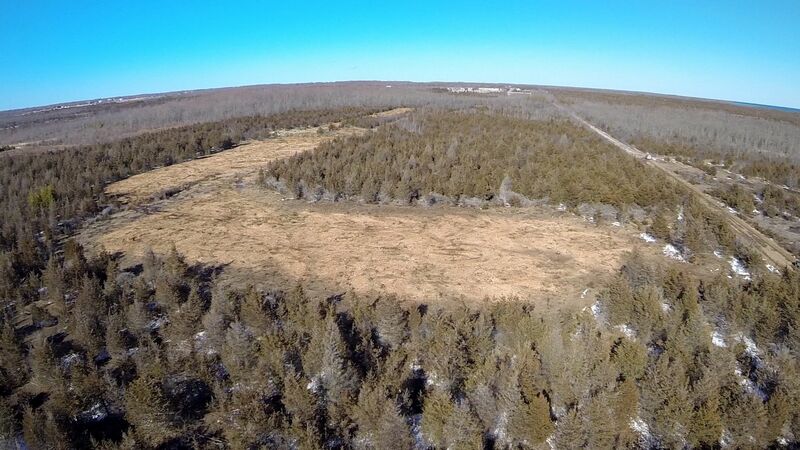 Specific concerns have been expressed about human health impacts, nuisance effects related to noise and the visual presence of the wind turbines on the landscape, bird deaths and disturbance to the habitat of rare fauna and flora. Research is underway in several jurisdictions e.g., Germany and Sweden related to the decommissioning, recycling and disposal of wind turbines and the associated infrastructure. No clear accountability and or funding arrangements are evident in Ontario to manage the decommissioning, recycling and disposal of components of existing and or planned wind projects. the urgency to combat climate change is now fully acknowledged by all key actors. To reverse the impacts of global warming, deep decarbonization of the global economy is now a priority for government action. Electrification across all economic sectors is considered a critical enabler for transitioning Ontario to a low carbon energy future. The LTEP’s role is to provide for the energy infrastructure that will facilitate this transition. The report provides an awful lot of technical analysis and deep thinking about how to craft an energy mix that will effectively “fight” what is actually a non-existent problem of manmade climate change. However, it is very valuable with respect to pointing out that the industrial wind turbine industry, as one of the climate industry’s fake-green energy “alternatives,” is utterly useless, actually damaging, economically speaking, not to mention destructive in every conceivable way for humans, communities, the land, and wildlife—birds and bats catastrophically so. ratepayers forked out $37 billion more than necessary from 2006 to 2014 and will spend an additional $133 billion by 2032 due to global adjustment electricity fees on hydro bills. Meanwhile, the provincial and federal Liberals, instead of addressing real environmental issues, kowtow to the UN-led massive scientific deception, by now a quasi religion, and stupidly, wilfully continue tilting at a deliberately concocted non-existent climate problem, betraying, oppressing, and impoverishing the people they are mandated to serve and protect. Canada’s broadcaster, the CBC, chief propagandist for the manmade climate change/manmade global warming cabal, featured Canada’s Minister of the Environment and Climate Change, Catherine McKenna, and the Administrator of the US Environmental Protection Agency (EPA), Gina McCarthy, on yesterday’s The Current, with host Anna-Maria Tremonti presiding. Pontificating about a non-existent problem, and prescribing a punitive tax remedy for it, McKenna and McCarthy, with Tremonti providing the cues, manage to parrot all the usual tired, alarmist, untrue, irrational manmade climate change tropes—multiple times—as listed further below. …technology choices…are competing effectively against fossil fuels; in many cases they are less expensive, so let people…choose, let the market capture…technologies that are are most able to compete…mostly renewables. …when you look at the markets and market forces, numerous renewables are now at par, in many cases, with fossil fuels and so…there’s a shift right now towards renewables. …continue to allow fossil to be in the mix until it’s no longer the one that’s viable or cost-effective…let the market decide, as long as we send the right market signals. …they have to successfully compete in the market. It’s not as much about EPA regulations but it is about the industry themselves and whether they can remain competitive. For example, in Ontario, “renewables” such as industrial wind turbines can spring up seemingly overnight, thanks to tailor-made, obstacle-free special legislation. Their owners go on to enjoy 20 years worth of guaranteed, significantly above-market rates of return. On the other hand, anti-oil, anti-gas, anti-coal, anti-pipeline regulations, rules, and strictures mean an unlevelled competitive field for the fossil fuel industry. As for Mc-Eco-Bots and their automated disinformation, read on . . . There hasn’t been any global warming for at least 19 years, but, according to the Mc-Fibbers, manmade climate change is really here, is really happening right now. They can feel it, they can see it, so why can’t you? Yes, climate changes all the time, always has, always will—naturally. The Mc-Deluded actually think that they can control the climate. The 11th century King Canute had more common sense, integrity, and honesty than McKenna, McCarthy and their political masters combined. A “low-carbon” future is code for de-development, de-industrialization, de-population, anti-democracy, anti-personal-freedoms, and consigns the poor to even deeper poverty, despair, and deprivation. It really is a tax on air. Think about it. “Sustainability” is code for anti-prosperity. The truth is that the kids will be far sicker, poorer, and more at risk if insane anti-human manmade climate change policies are implemented. The scientific fiction, fuelled by a $1.5 trillion climate change industry, continues apace, scarcely hindered by the truth, or valid science, or the scientific method. We need more courageous and honest leadership in the political class. We need more common sense, more mainstream media investigative journalism, more reason. We need more public awareness that the cry-wolf, pretend-green potentates of the manmade climate change narrative are liars, utterly lacking in clothing and any scrap of integrity. Dr. Ross McKitrick is a Professor of Economics at the University of Guelph, and Research Chair in Energy, Ecology and Prosperity at the Frontier Centre for Public Policy. He specializes in environmental economics. In his brief talk, Dr. McKitrick gives a brilliant, succinct overview of the current absence of rational, logical, empirical evidence-based thinking and planning on the part of the Canadian political class when it comes to the environment and economic policies. Dr. McKitrick argues that our “very high-level” decision-makers are churning out “extremely distorting” policies based on their false, alarmist environmental beliefs. The results of their scientific illiteracy and ideological alarmism are environmental over-regulation and “green” taxation overkill. Reading between the lines, we’re in a big, fat, fake-green mess and heading for continued fiscal and economic misery. The following is a partial transcription (bolding added for emphasis). The trouble in the Canadian context is, the economic logic only works if they used “instead of,” and not on “on top of” a command-and-control regime….repeal the onerous regulations that we’ve already got in place, like for instance, the Green Energy Act in Ontario, and the federal ethanol mandate, and the proposed coal fadeout in Alberta. Unless you’re willing to roll up your sleeves and work against those things in a very vocal way, you’re not really in a position to make a credible argument for green taxes in Canada. Otherwise, it’s just going to be one thing piled on top of another. The mayor of Montreal is so worried about the state of the environment that he’s leading a campaign to block the Energy East pipeline from reaching Montreal, presumably because he thinks that the contents of that pipeline will be damaging to the local environment. He has in mind, I guess, a graph like this, except that it would slope up instead of sloping down, and lots of other graphs, presumably in his imagination, that slope up rather than sloping down. If you want to see what all the other graphs look like, I’ve put them online at a website called yourenvironment.ca. It’s very easy to navigate. You can look up the complete air quality records for every city in Canada, and lots of other information besides—climate information, CO2 emissions, all sorts of stuff. Once you get a handle on what’s actually happened to the environment in Canada, you’re going to think the problem is a little different. It’s regulatory overkill. We’re at a point where we have controlled conventional air pollutants to an extremely low level in Canada, and yet we’re seeing an acceleration of new and extremely distorting policies, including the various attempts to blockade all pipeline development and keep the western fossil fuel reserves in the ground. I can only conclude that a lot the decision-makers—and this kind of thinking is embedded at very high levels—have in mind a completely false picture of the Canadian environment. They’ve been convinced that it’s much worse than it is and that the trends are going in different directions. The real target today is environmental alarmism. It’s this irrational but popular ideology that the environment is bad and getting worse, that we face an emergency and that we have to take radical measures. It’s easy to defeat once you start showing people the data, and it’s easy to defeat if you can get a hearing for the idea that if you get specific about what you’re really talking about, we can measure these things. In fact, we do measure them, and in Canada we have decades and decades worth of measurements. So you can get the discussion on a very rational footing. We should encourage people to discuss the science, and we do it in a deep way—and not with the slogans like the “97% consensus,” which is another one of these phony statistics that emerges. What we need to do is to get people to think clearly about what it is they are talking about. Are you concerned about air pollution? Well, we have the data on all the major air contaminants. We can measure it, this is what it looks like…It’s not one big thing. It’s a lot of little things and most of them are actually being handled very effectively by our current regulatory systems in Canada. We have a problem of overkill in some areas, including, for instance, the coal phase-out in Ontario. That was a huge overkill in response to the air emissions issue…They didn’t need to phase out those coal-fired power plants. But it’s the alarmism that made it impossible to have that debate at the time. When governments start to hauling out the issue of extreme weather, there is nothing mainstream about that kind of science. The mainstream science, including the IPCC, does not draw a connection between greenhouse gas emissions and extreme weather events. So, politicians need to be called on that sort of thing. And also, finally, don’t overstate the challenge. I was struck this week by research that came out of Yale University, that even after all these years of propaganda and browbeating, Canadians are roughly evenly-split on whether global warming is mostly anthropogenic, but so is the scientific community…Once you try to move to something more specific than that—like, is it the most? or if it is responsible, is it even a problem?— that’s where that kind of consensus breaks down. So don’t overstate the problem! You need to understand that the problem is actually alarmism, and the raft of false beliefs, and not the need for little tweaks to the tax code. Watch Dr. McKitrick’s whole presentation here, starting at :19. Must read, must see, must hear! 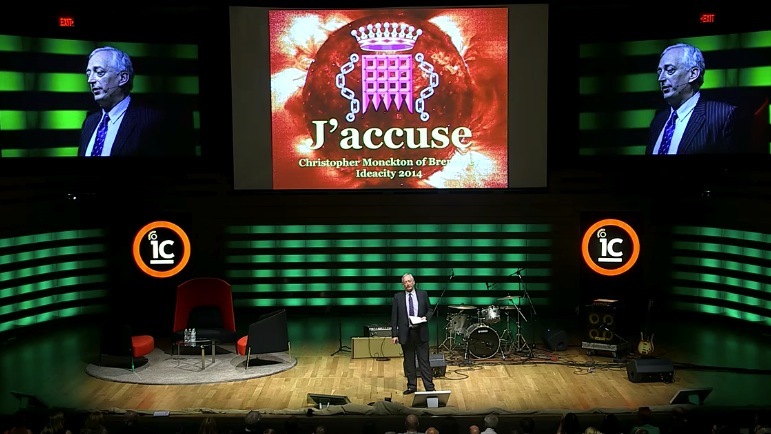 Christopher Monckton, the Viscount Monckton of Brenchley, gave an impassioned and hard-hitting talk on the issue of climate change at the ideacity conference in Toronto on June 18, 2014. WATCH: Click here to see the video of his talk. And that the cost of preventing global warming that is not occurring is 10-100 times that of adapting to its consequences even if it were to occur.